The Bodmin Gospels of St Petroc's Priory, Bodmin, in Cornwall, are an important survival, providing a glimpse of Cornwall's early history. In many ways, their pages look back further still than the late 9th century when they were made. While the script in which they are written is much like that in use in contemporary France and Anglo-Saxon England, the design of many of the pages and the kind of ornament used also resemble what is seen in Irish and British gospel manuscripts from the 7th to 8th centuries. It was probably made in Brittany, a 'Celtic' area where cultural links with western Britain and Ireland were maintained. The Gospel of Luke is titled in capital letters that are based on script used by the Romans and which had been used for headings in Anglo-Saxon England from the late 7th or early 8th century. 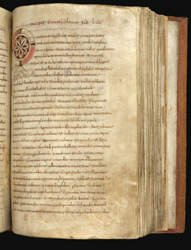 The gospel text after the first line is written in a version of a script that began in the Continental scriptoria around Charlemagne's time, late 8th to early 9th century, and was adopted by the Anglo-Saxons. The large initial, however, with its rosette ornament presents an updated version of decoration that can be seen in a 7th century manuscript from the Irish monastery of Bobbio, in Italy.